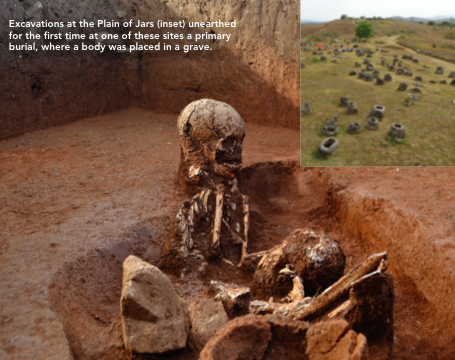 Archaeologists from The Australian National University have unearthed a 2500-year-old burial ground at one of Asia’s most mysterious sites – the Plain of Jars in Laos. The project in central Laos is the first major archaeological dig since the 1930s at any of the 90 sites that make up the Plain of Jars. The sites feature ancient carved stone jars up to 3 metres tall, but their purpose remains a mystery. “This will be the first major effort since the 1930s to attempt to understand the purpose of the jars and who created them,” said project leader Dr Dougald O’Reilly. “One theory is that they were used to decompose the bodies. Later, after the flesh was removed, the remains may have been buried around the jars. O’Reilly explained that it was difficult to determine the status of the buried individuals due to a lack of material objects buried with them. Genetic analysis might shed some light on whom these people were related to. The Laos government is pushing for the Plain of Jars to be listed as a UNESCO World Heritage site.